This article is about the 1982 war. For the 1770 diplomatic crisis, see Falklands Crisis (1770). An undeclared war is a military conflict between two or more nations without either side issuing a formal declaration of war. The term is sometimes used to include any disagreement or conflict fought about without an official declaration. Since the United Nations "police action" in Korea followed the example set by the United Kingdom during the so-called Malayan Emergency, a number of democratic governments have pursued disciplinary actions and limited warfare by characterizing them as something else, such as a "military action" or "armed response". The conflict was a major episode in the protracted confrontation over the territories' sovereignty. Argentina asserted (and maintains) that the islands are Argentine territory,  and the Argentine government thus characterised its military action as the reclamation of its own territory. The British government regarded the action as an invasion of a territory that had been a Crown colony since 1841. Falkland Islanders, who have inhabited the islands since the early 19th century, are predominantly descendants of British settlers, and strongly favour British sovereignty. Neither state officially declared war, although both governments declared the Islands a war zone. Hostilities were almost exclusively limited to the territories under dispute and the area of the South Atlantic where they lie. The history of the Falkland Islands goes back at least five hundred years, with active exploration and colonisation only taking place in the 18th century. Nonetheless, the islands have been a matter of controversy, as they have been claimed by the French, British, Spaniards and Argentines at various points. The cultural impact of the Falklands War spanned several media in both Britain and Argentina. A number of films and television productions emerged from the conflict. The first Argentine film about the war was Los chicos de la guerra in 1984. The BBC drama Tumbledown (1988) told the story of a British officer who got paralysed due to a bullet wound. The computer game Harrier Attack (1983) and the naval strategy game Strike Fleet (1987) are two examples of Falklands-related games. A number of fictional works were set during the Falklands War, including in Stephen King's novella The Langoliers (1990), in which the character Nick Hopewell is a Falklands veteran. The war provided a wealth of material for non-fiction writers; in the United Kingdom (UK) an important account became Max Hastings and Simon Jenkins' The Battle for the Falklands. The Constitution of Argentina is the basic governing document of Argentina, and the primary source of existing law in Argentina. Its first version was written in 1853 by a Constitutional Assembly gathered in Santa Fe, and the doctrinal basis was taken in part from the United States Constitution. It was then reformed in 1860, 1866, 1898, 1949, 1957, and the current version is the reformed text of 1994. Jorge Rafael Videla was a senior commander in the Argentine Army and dictator of Argentina from 1976 to 1981. Civil disorder, also known as civil disturbance or civil unrest, is an activity arising from a mass act of civil disobedience in which the participants become hostile toward authority, and authorities incur difficulties in maintaining public safety and order, over the disorderly crowd. It is, in any form, prejudicial to public law and order..
A diversionary foreign policy, or a diversionary war, is an international relations term that identifies a war instigated by a country's leader in order to distract its population from their own domestic strife. The concept stems from the Diversionary War Theory, which states that leaders who are threatened by domestic turmoil occasionally initiate an international conflict in order to shift the nation's attention away from internal troubles. As a result, this external threat would counter the domestic strife and ensure the leader's position in power. Essentially, a diversionary use of force is a manipulation of the Rally Round the Flag Syndrome effect, causing an increase of national fervor from the general public. The Dirty War is the name used by the military junta or civic-military dictatorship of Argentina for the period of United States-backed state terrorism in Argentina from 1974 to 1983 as a part of Operation Condor, during which military and security forces and right-wing death squads in the form of the Argentine Anticommunist Alliance hunted down any political dissidents and anyone believed to be associated with socialism, left-wing Peronism or the Montoneros movement. The ongoing tension between the two countries over the islands increased on 19 March when a group of Argentine scrap metal merchants (actually infiltrated by Argentine marines) raised the Argentine flag at South Georgia Island, an act that would later be seen as the first offensive action in the war. The Royal Navy ice patrol vessel HMS Endurance was dispatched from Stanley to South Georgia on the 25th in response. The Argentine military junta, suspecting that the UK would reinforce its South Atlantic Forces,  ordered the invasion of the Falkland Islands to be brought forward to 2 April. On 2 April 1982, Argentine forces mounted amphibious landings, known as Operation Rosario,  on the Falkland Islands. The invasion was met with a nominal defence organised by the Falkland Islands' Governor Sir Rex Hunt, giving command to Major Mike Norman of the Royal Marines. The events of the invasion included the landing of Lieutenant Commander Guillermo Sanchez-Sabarots' Amphibious Commandos Group, the attack on Moody Brook barracks, the engagement between the troops of Hugo Santillan and Bill Trollope at Stanley, and the final engagement and surrender at Government House. 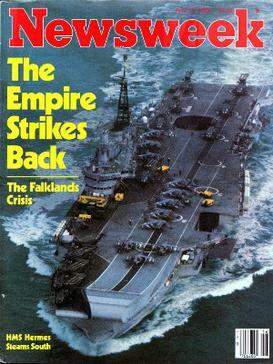 The cover of Newsweek magazine, 19 April 1982, depicts HMS Hermes, flagship of the British Task Force. The headline evokes the 1980 Star Wars sequel. The war was an unexpected event in a world strained by the Cold War and the North–South divide. The response of some countries was the effort to mediate the crisis and later as the war began, the support (or criticism) based in terms of anti-colonialism, political solidarity, historical relationships or realpolitik. HMS Invincible, one of two aircraft carriers that the Royal Navy had available for the task force. By mid-April, the Royal Air Force had set up the airbase of RAF Ascension Island, co-located with Wideawake Airfield on the mid-Atlantic British overseas territory of Ascension Island, including a sizeable force of Avro Vulcan B Mk 2 bombers, Handley Page Victor K Mk 2 refuelling aircraft, and McDonnell Douglas Phantom FGR Mk 2 fighters to protect them. Meanwhile, the main British naval task force arrived at Ascension to prepare for active service. A small force had already been sent south to recapture South Georgia. The South Georgia force, Operation Paraquet , under the command of Major Guy Sheridan RM, consisted of Marines from 42 Commando, a troop of the Special Air Service (SAS) and Special Boat Service (SBS) troops who were intended to land as reconnaissance forces for an invasion by the Royal Marines. All were embarked on RFA Tidespring. First to arrive was the Churchill-class submarine HMS Conqueror on 19 April, and the island was over-flown by a radar-mapping Handley Page Victor on 20 April. The first landings of SAS troops took place on 21 April, but—with the southern hemisphere autumn setting in—the weather was so bad that their landings and others made the next day were all withdrawn after two helicopters crashed in fog on Fortuna Glacier. 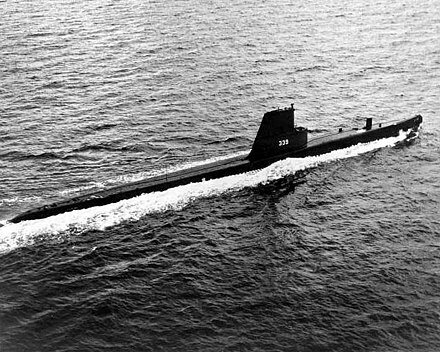 On 23 April, a submarine alert was sounded and operations were halted, with Tidespring being withdrawn to deeper water to avoid interception. On 24 April, the British forces regrouped and headed in to attack. On 25 April, after resupplying the Argentine garrison in South Georgia, the submarine ARA Santa Fe was spotted on the surface  by a Westland Wessex HAS Mk 3 helicopter from HMS Antrim, which attacked the Argentine submarine with depth charges. HMS Plymouth launched a Westland Wasp HAS.Mk.1 helicopter, and HMS Brilliant launched a Westland Lynx HAS Mk 2. The Lynx launched a torpedo, and strafed the submarine with its pintle-mounted general purpose machine gun; the Wessex also fired on Santa Fe with its GPMG. The Wasp from HMS Plymouth as well as two other Wasps launched from HMS Endurance fired AS-12 ASM antiship missiles at the submarine, scoring hits. Santa Fe was damaged badly enough to prevent her from diving. The crew abandoned the submarine at the jetty at King Edward Point on South Georgia. On 1 May, British operations on the Falklands opened with the "Black Buck 1" attack (of a series of five) on the airfield at Stanley. A Vulcan bomber from Ascension flew on an 8,000-nautical-mile (15,000 km; 9,200 mi) round trip dropping conventional bombs across the runway at Stanley and back to Ascension. The mission required repeated refuelling, and required several Victor K2 tanker aircraft operating in concert, including tanker to tanker refuelling. The overall effect of the raids on the war is difficult to determine, and the raids consumed precious tanker resources from Ascension,  but also prevented Argentina from stationing fast jets on the islands. Of the five Black Buck raids, three were against Stanley Airfield, with the other two anti-radar missions using Shrike anti-radiation missiles. The Falklands had only three airfields. The longest and only paved runway was at the capital, Stanley, and even that was too short to support fast jets (although an arrestor gear was fitted in April to support Skyhawks). Therefore, the Argentines were forced to launch their major strikes from the mainland, severely hampering their efforts at forward staging, combat air patrols, and close air support over the islands. The effective loiter time of incoming Argentine aircraft was low, and they were later compelled to overfly British forces in any attempt to attack the islands. 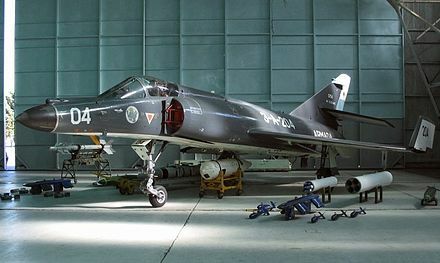 The first major Argentine strike force comprised 36 aircraft (A-4 Skyhawks, IAI Daggers, English Electric Canberras, and Mirage III escorts), and was sent on 1 May, in the belief that the British invasion was imminent or landings had already taken place. Only a section of Grupo 6 (flying IAI Dagger aircraft) found ships, which were firing at Argentine defences near the islands. The Daggers managed to attack the ships and return safely. This greatly boosted morale of the Argentine pilots, who now knew they could survive an attack against modern warships, protected by radar ground clutter from the Islands and by using a late pop up profile. Meanwhile, other Argentine aircraft were intercepted by BAE Sea Harriers operating from HMS Invincible. A Dagger  and a Canberra were shot down. As a result of this experience, Argentine Air Force staff decided to employ A-4 Skyhawks and Daggers only as strike units, the Canberras only during the night, and Mirage IIIs (without air refuelling capability or any capable AAM) as decoys to lure away the British Sea Harriers. The decoying would be later extended with the formation of the Escuadrón Fénix, a squadron of civilian jets flying 24 hours-a-day simulating strike aircraft preparing to attack the fleet. On one of these flights on 7 June, an Air Force Learjet 35A was shot down, killing the squadron commander, Vice Commodore Rodolfo De La Colina, the highest-ranking Argentine officer to die in the war. Stanley was used as an Argentine strongpoint throughout the conflict. Despite the Black Buck and Harrier raids on Stanley airfield (no fast jets were stationed there for air defence) and overnight shelling by detached ships, it was never out of action entirely. Stanley was defended by a mixture of surface-to-air missile (SAM) systems (Franco-German Roland and British Tigercat) and Swiss-built Oerlikon 35 mm twin anti-aircraft cannons. Lockheed Hercules transport night flights brought supplies, weapons, vehicles, and fuel, and airlifted out the wounded up until the end of the conflict. 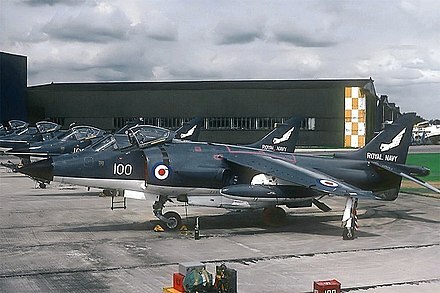 The only Argentine Hercules shot down by the British was lost on 1 June when TC-63 was intercepted by a Sea Harrier in daylight   when it was searching for the British fleet north-east of the islands after the Argentine Navy retired its last SP-2H Neptune due to airframe attrition. Two British naval task forces (one of surface vessels and one of submarines) and the Argentine fleet were operating in the neighbourhood of the Falklands and soon came into conflict. The first naval loss was the Second World War-vintage Argentine light cruiser ARA General Belgrano. The nuclear-powered submarine HMS Conqueror sank General Belgrano on 2 May. Three hundred and twenty-three members of General Belgrano's crew died in the incident. More than 700 men were rescued from the open ocean despite cold seas and stormy weather. The losses from General Belgrano totalled nearly half of the Argentine deaths in the Falklands conflict and the loss of the ship hardened the stance of the Argentine government. Regardless of controversies over the sinking—including disagreement about the exact nature of the maritime exclusion zone and whether General Belgrano had been returning to port at the time of the sinking—it had a crucial strategic effect: the elimination of the Argentine naval threat. 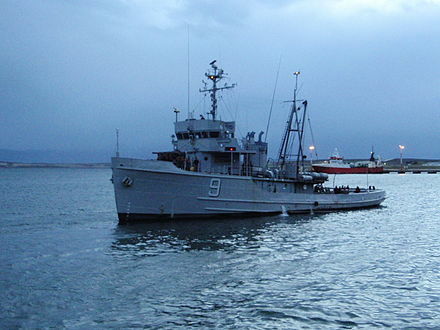 After her loss, the entire Argentine fleet, with the exception of the diesel-powered submarine ARA San Luis,  returned to port and did not leave again during the fighting. The two escorting destroyers and the battle group centred on the aircraft carrier ARA Veinticinco de Mayo both withdrew from the area, ending the direct threat to the British fleet that their pincer movement had represented. In a separate incident later that night, British forces engaged an Argentine patrol gunboat, the ARA Alferez Sobral, that was searching for the crew of the Argentine Air Force Canberra light bomber shot down on 1 May. Two Royal Navy Lynx helicopters fired four Sea Skua missiles at her. Badly damaged and with eight crew dead, Alferez Sobral managed to return to Puerto Deseado two days later. The Canberra's crew were never found. 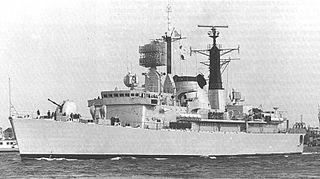 On 4 May, two days after the sinking of General Belgrano, the British lost the Type 42 destroyer HMS Sheffield to fire following an Exocet missile strike from the Argentine 2nd Naval Air Fighter/Attack Squadron. Sheffield had been ordered forward with two other Type 42s to provide a long-range radar and medium-high altitude missile picket far from the British carriers. She was struck amidships, with devastating effect, ultimately killing 20 crew members and severely injuring 24 others. The ship was abandoned several hours later, gutted and deformed by the fires that continued to burn for six more days. She finally sank outside the Maritime Exclusion Zone on 10 May. The incident is described in detail by Admiral Sandy Woodward in his book One Hundred Days, in Chapter One. Woodward was a former commanding officer of Sheffield. The destruction of Sheffield (the first Royal Navy ship sunk in action since the Second World War) had a profound impact on the British public, bringing home the fact that the "Falklands Crisis", as the BBC News put it, was now an actual "shooting war". The 4,000 men of 3 Commando Brigade were put ashore as follows: 2nd Battalion, Parachute Regiment (2 Para) from the RORO ferry Norland and 40 Commando Royal Marines from the amphibious ship HMS Fearless were landed at San Carlos (Blue Beach), 3rd Battalion, Parachute Regiment (3 Para) from the amphibious ship HMS Intrepid was landed at Port San Carlos (Green Beach) and 45 Commando from RFA Stromness was landed at Ajax Bay (Red Beach). Notably, the waves of eight LCUs and eight LCVPs were led by Major Ewen Southby-Tailyour, who had commanded the Falklands detachment NP8901 from March 1978 to 1979. 42 Commando on the ocean liner SS Canberra was a tactical reserve. Units from the Royal Artillery, Royal Engineers, etc. and armoured reconnaissance vehicles were also put ashore with the landing craft, the Round Table class LSL and mexeflote barges. Rapier missile launchers were carried as underslung loads of Sea Kings for rapid deployment. By dawn the next day, they had established a secure beachhead from which to conduct offensive operations. From there, Brigadier Julian Thompson's plan was to capture Darwin and Goose Green before turning towards Port Stanley. Now, with the British troops on the ground, the Argentine Air Force began the night bombing campaign against them using Canberra bomber planes until the last day of the war (14 June). At sea, the paucity of the British ships' anti-aircraft defences was demonstrated in the sinking of HMS Ardent on 21 May, HMS Antelope on 24 May, and MV Atlantic Conveyor (struck by two AM39 Exocets) on 25 May along with a vital cargo of helicopters, runway-building equipment and tents. The loss of all but one of the Chinook helicopters being carried by the Atlantic Conveyor was a severe blow from a logistical perspective. Also lost on this day was HMS Coventry, a sister to Sheffield, whilst in company with HMS Broadsword after being ordered to act as a decoy to draw away Argentine aircraft from other ships at San Carlos Bay. HMS Argonaut and HMS Brilliant were badly damaged. However, many British ships escaped being sunk because of weaknesses of the Argentine pilots' bombing tactics described below. To avoid the highest concentration of British air defences, Argentine pilots released ordnance from very low altitude, and hence their bomb fuzes did not have sufficient time to arm before impact. The low release of the retarded bombs (some of which the British had sold to the Argentines years earlier) meant that many never exploded, as there was insufficient time in the air for them to arm themselves. A simple free-fall bomb in a low altitude release, impacts almost directly below the aircraft, which is then within the lethal fragmentation zone of the explosion. A retarded bomb has a small parachute or air brake that opens to reduce the speed of the bomb to produce a safe horizontal separation between the bomb and the aircraft. The fuze for a retarded bomb requires that the retarder be open a minimum time to ensure safe separation. The pilots would have been aware of this—but due to the high concentration required to avoid SAMs, Anti-Aircraft Artillery (AAA), and British Sea Harriers, many failed to climb to the necessary release point. The Argentine forces solved the problem by fitting improvised retarding devices, allowing the pilots to effectively employ low-level bombing attacks on 8 June. In his autobiographical account of the Falklands War, Admiral Woodward blamed the BBC World Service for disclosing information that led the Argentines to change the retarding devices on the bombs. The World Service reported the lack of detonations after receiving a briefing on the matter from a Ministry of Defence official. He describes the BBC as being more concerned with being "fearless seekers after truth" than with the lives of British servicemen. Colonel 'H'. Jones levelled similar accusations against the BBC after they disclosed the impending British attack on Goose Green by 2 Para. From early on 27 May until 28 May, 2 Para, (approximately 500 men) with naval gunfire support from HMS Arrow  and artillery support from 8 Commando Battery, Royal Artillery, approached and attacked Darwin and Goose Green, which was held by the Argentine 12th Infantry Regiment. After a tough struggle that lasted all night and into the next day, the British won the battle; in all, 17 British and 47 Argentine soldiers were killed. In total 961 Argentine troops (including 202 Argentine Air Force personnel of the Condor airfield) were taken prisoner. The BBC announced the taking of Goose Green on the BBC World Service before it had actually happened. It was during this attack that Lieutenant Colonel H. Jones, the commanding officer of 2 Para, was killed at the head of his battalion while charging into the well-prepared Argentine positions. He was posthumously awarded the Victoria Cross. With the sizeable Argentine force at Goose Green out of the way, British forces were now able to break out of the San Carlos beachhead. On 27 May, men of 45 Cdo and 3 Para started a loaded march across East Falkland towards the coastal settlement of Teal Inlet. Meanwhile, 42 Commando prepared to move by helicopter to Mount Kent. [nb 7] Unknown to senior British officers, the Argentine generals were determined to tie down the British troops in the Mount Kent area, and on 27 and 28 May they sent transport aircraft loaded with Blowpipe surface-to-air missiles and commandos (602nd Commando Company and 601st National Gendarmerie Special Forces Squadron) to Stanley. This operation was known as Operation Autoimpuesta ("Self-determination initiative"). The Argentine Navy used their last AM39 Exocet missile attempting to attack HMS Invincible on 30 May. There are Argentine claims that the missile struck;   however, the British have denied this, some citing that HMS Avenger shot it down. When Invincible returned to the UK after the war, she showed no signs of missile damage. On 31 May, the M&AWC defeated Argentine Special Forces at the skirmish at Top Malo House. A 13-strong Argentine Army Commando detachment (Captain José Vercesi's 1st Assault Section, 602nd Commando Company) found itself trapped in a small shepherd's house at Top Malo. The Argentine commandos fired from windows and doorways and then took refuge in a stream bed 200 metres (700 ft) from the burning house. Completely surrounded, they fought 19 M&AWC marines under Captain Rod Boswell for 45 minutes until, with their ammunition almost exhausted, they elected to surrender. Three Cadre members were badly wounded. 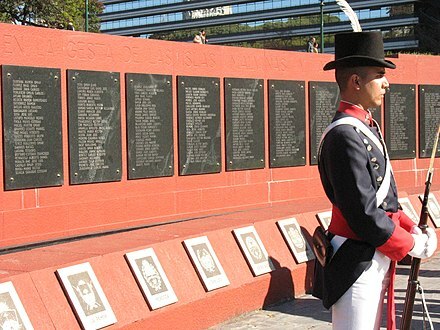 On the Argentine side, there were two dead, including Lieutenant Ernesto Espinoza and Sergeant Mateo Sbert (who were posthumously decorated for their bravery). Only five Argentines were left unscathed. As the British mopped up Top Malo House, Lieutenant Fraser Haddow's M&AWC patrol came down from Malo Hill, brandishing a large Union Flag. One wounded Argentine soldier, Lieutenant Horacio Losito, commented that their escape route would have taken them through Haddow's position. The Guards were sent to support an advance along the southern approach to Stanley. On 2 June, a small advance party of 2 Para moved to Swan Inlet house in a number of Army Westland Scout helicopters. Telephoning ahead to Fitzroy, they discovered that the area was clear of Argentines and (exceeding their authority) commandeered the one remaining RAF Chinook helicopter to frantically ferry another contingent of 2 Para ahead to Fitzroy (a settlement on Port Pleasant) and Bluff Cove (a settlement on Port Fitzroy). This uncoordinated advance caused great difficulties in planning for the commanders of the combined operation, as they now found themselves with a 30 miles (48 km) string of indefensible positions on their southern flank. Support could not be sent by air as the single remaining Chinook was already heavily oversubscribed. The soldiers could march, but their equipment and heavy supplies would need to be ferried by sea. Plans were drawn up for half the Welsh Guards to march light on the night of 2 June, whilst the Scots Guards and the second half of the Welsh Guards were to be ferried from San Carlos Water in the Landing Ship Logistics (LSL) Sir Tristram and the landing platform dock (LPD) Intrepid on the night of 5 June. Intrepid was planned to stay one day and unload itself and as much of Sir Tristram as possible, leaving the next evening for the relative safety of San Carlos. Escorts would be provided for this day, after which Sir Tristram would be left to unload using a Mexeflote (a powered raft) for as long as it took to finish. Political pressure from above to not risk the LPD forced Commodore Clapp to alter this plan. Two lower-value LSLs would be sent, but with no suitable beaches to land on, Intrepid's landing craft would need to accompany them to unload. A complicated operation across several nights with Intrepid and her sister ship Fearless sailing half-way to dispatch their craft was devised. The attempted overland march by half the Welsh Guards failed, possibly as they refused to march light and attempted to carry their equipment. They returned to San Carlos and landed directly at Bluff Cove when Fearless dispatched her landing craft. Sir Tristram sailed on the night of 6 June and was joined by Sir Galahad at dawn on 7 June. Anchored 1,200 feet (370 m) apart in Port Pleasant, the landing ships were near Fitzroy, the designated landing point. The landing craft should have been able to unload the ships to that point relatively quickly, but confusion over the ordered disembarkation point (the first half of the Guards going direct to Bluff Cove) resulted in the senior Welsh Guards infantry officer aboard insisting that his troops should be ferried the far longer distance directly to Port Fitzroy/Bluff Cove. The alternative was for the infantrymen to march via the recently repaired Bluff Cove bridge (destroyed by retreating Argentine combat engineers) to their destination, a journey of around seven miles (11 km). The longer journey time of the landing craft taking the troops directly to Bluff Cove and the squabbling over how the landing was to be performed caused an enormous delay in unloading. This had disastrous consequences. Without escorts, having not yet established their air defence, and still almost fully laden, the two LSLs in Port Pleasant were sitting targets for two waves of Argentine A-4 Skyhawks. The disaster at Port Pleasant (although often known as Bluff Cove) would provide the world with some of the most sobering images of the war as TV news video footage showed Navy helicopters hovering in thick smoke to winch survivors from the burning landing ships. British casualties were 48 killed and 115 wounded. Three Argentine pilots were also killed. The air strike delayed the scheduled British ground attack on Stanley by two days. 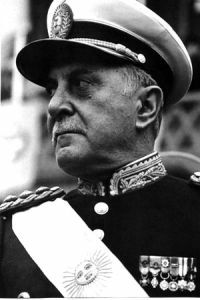 Argentine General Mario Menéndez, commander of Argentine forces in the Falklands, was told that 900 British soldiers had died. He expected that the losses would cause enemy morale to drop and the British assault to stall. On the night of 11 June, after several days of painstaking reconnaissance and logistic build-up, British forces launched a brigade-sized night attack against the heavily defended ring of high ground surrounding Stanley. Units of 3 Commando Brigade, supported by naval gunfire from several Royal Navy ships, simultaneously attacked in the Battle of Mount Harriet, Battle of Two Sisters, and Battle of Mount Longdon. Mount Harriet was taken at a cost of 2 British and 18 Argentine soldiers. At Two Sisters, the British faced both enemy resistance and friendly fire, but managed to capture their objectives. The toughest battle was at Mount Longdon. British forces were bogged down by assault rifle, mortar, machine gun, artillery fire, sniper fire, and ambushes. Despite this, the British continued their advance. During this battle, 13 were killed when HMS Glamorgan, straying too close to shore while returning from the gun line, was struck by an improvised trailer-based Exocet MM38 launcher taken from the destroyer ARA Seguí by Argentine Navy technicians. On the same day, Sergeant Ian McKay of 4 Platoon, B Company, 3 Para died in a grenade attack on an Argentine bunker, which earned him a posthumous Victoria Cross. After a night of fierce fighting, all objectives were secured. Both sides suffered heavy losses. The second phase of attacks began on the night of 13 June, and the momentum of the initial assault was maintained. 2 Para, with light armour support from the Blues and Royals, captured Wireless Ridge, with the loss of 3 British and 25 Argentine lives, and the 2nd battalion, Scots Guards captured Mount Tumbledown at the Battle of Mount Tumbledown, which cost 10 British and 30 Argentine lives. A ceasefire was declared on 14 June and the commander of the Argentine garrison in Stanley, Brigade General Mario Menéndez, surrendered to Major General Jeremy Moore the same day. Of the 86 Royal Navy personnel, 22 were lost in HMS Ardent, 19 + 1 lost in HMS Sheffield, 19 + 1 lost in HMS Coventry and 13 lost in HMS Glamorgan. Fourteen naval cooks were among the dead, the largest number from any one branch in the Royal Navy. Thirty-three of the British Army's dead came from the Welsh Guards (32 of which died on the RFA Sir Galahad in the Bluff Cove Air Attacks), 21 from the 3rd Battalion, the Parachute Regiment, 18 from the 2nd Battalion, the Parachute Regiment, 19 from the Special Air Service, 3 from Royal Signals and 8 from each of the Scots Guards and Royal Engineers. The 1st battalion/7th Duke of Edinburgh's Own Gurkha Rifles lost one man. There were 1,188 Argentine and 777 British non-fatal casualties. Further information about the field hospitals and hospital ships is at Ajax Bay and List of hospitals and hospital ships of the Royal Navy. On the Argentine side beside the Military Hospital at Port Stanley, the Argentine Air Force Mobile Field Hospital was deployed at Comodoro Rivadavia. Before British offensive operations began, the British and Argentine governments agreed to establish an area on the high seas where both sides could station hospital ships without fear of attack by the other side. This area, a circle 20 nautical miles in diameter, was referred to as the Red Cross Box ( 48°30′S53°45′W﻿ / ﻿48.500°S 53.750°W﻿ / -48.500; -53.750 ), about 45 miles (72 km) north of Falkland Sound. Ultimately, the British stationed four ships (HMS Hydra, HMS Hecla and HMS Herald and the primary hospital ship SS Uganda) within the box, while the Argentines stationed three (ARA Almirante Irízar, Bahia Paraiso and Puerto Deseado). The hospital ships were non-warships converted to serve as hospital ships. The three British naval vessels were survey vessels and Uganda was a passenger liner. Almirante Irizar was an icebreaker, Bahia Paraiso was an Antarctic supply transport and Puerto Deseado was a survey ship. The British and Argentine vessels operating within the Box were in radio contact and there was some transfer of patients between the hospital ships. For example, the Uganda on four occasions transferred patients to an Argentine hospital ship. 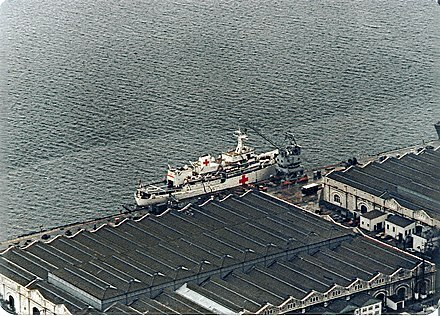 The British naval hospital ships operated as casualty ferries, carrying casualties from both sides from the Falklands to Uganda and operating a shuttle service between the Red Cross Box and Montevideo. Throughout the conflict officials of the International Committee of the Red Cross (ICRC) conducted inspections to verify that all concerned were abiding by the rules of the Geneva Conventions. On 12 June, some personnel were transferred from the Argentine hospital ship to the British ships by helicopter. Argentine naval officers also inspected the British casualty ferries in the estuary of the River Plate. This brief war brought many consequences for all the parties involved, besides the considerable casualty rate and large materiel loss, especially of shipping and aircraft, relative to the deployed military strengths of the opposing sides. In the United Kingdom, Margaret Thatcher's popularity increased. The success of the Falklands campaign was widely regarded as a factor in the turnaround in fortunes for the Conservative government, who had been trailing behind the SDP-Liberal Alliance in the opinion polls for months before the conflict began, but after the success in the Falklands the Conservatives returned to the top of the opinion polls by a wide margin and went on to win the following year's general election by a landslide. Subsequently, Defence Secretary Nott's proposed cuts to the Royal Navy were abandoned. The islanders subsequently had full British citizenship restored in 1983, their lifestyle was improved by investments the UK made after the war and by the liberalisation of economic measures that had been stalled through fear of angering Argentina. In 1985, a new constitution was enacted promoting self-government, which has continued to devolve power to the islanders. In Argentina, defeat in the Falklands War meant that a possible war with Chile was avoided. Further, Argentina returned to a democratic government in the 1983 general election, the first free general election since 1973. It also had a major social impact, destroying the military's image as the "moral reserve of the nation" that they had maintained through most of the 20th century. Militarily, the Falklands conflict remains the largest air-naval combat operation between modern forces since the end of the Second World War. As such, it has been the subject of intense study by military analysts and historians. The most significant "lessons learned" include: the vulnerability of surface ships to anti-ship missiles and submarines, the challenges of coordinating logistical support for a long-distance projection of power, and reconfirmation of the role of tactical air power, including the use of helicopters. 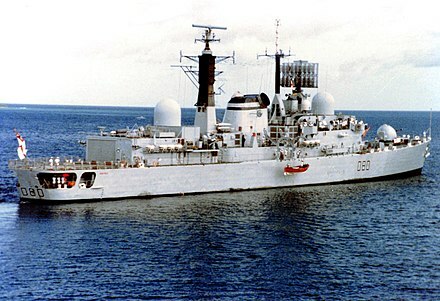 In 1986, the BBC broadcast the Horizon programme, In the Wake of HMS Sheffield, which discussed lessons learned from the conflict, and measures since taken to implement them, such as stealth ships and close-in weapon systems. In addition to memorials on the islands, there is a memorial in the crypt of St Paul's Cathedral, London to the British war dead. The Falkland Islands Memorial Chapel at Pangbourne College was opened in March 2000 as a commemoration of the lives and sacrifice of all those who served and died in the South Atlantic in 1982. In Argentina, there is a memorial at Plaza San Martín in Buenos Aires,  another one in Rosario, and a third one in Ushuaia. During the war, British dead were put into plastic body bags and buried in mass graves. After the war, the bodies were recovered; 14 were reburied at Blue Beach Military Cemetery and 64 were returned to the UK. Although some minefields have been cleared, a substantial number of them still exist in the islands, such as this one at Port William on East Falkland. As of 2011 [update] , there were 113 uncleared minefields on the Falkland Islands and unexploded ordnance (UXOs) covering an area of 13 km2 (5.0 sq mi). Of this area, 5.5 km2 (2.1 sq mi) on the Murrell Peninsula were classified as being "suspected minefields"—the area had been heavily pastured for the previous 25 years without incident. It was estimated that these minefields had 20,000 anti-personnel mines and 5,000 anti-tank mines. No human casualties from mines or UXO have been reported in the Falkland Islands since 1984, and no civilian mine casualties have ever occurred on the islands. The UK reported six military personnel were injured in 1982 and a further two injured in 1983. Most military accidents took place while clearing the minefields in the immediate aftermath of the 1982 conflict or in the process of trying to establish the extent of the minefield perimeters, particularly where no detailed records existed. Seventeen newspaper reporters, two photographers, two radio reporters and three television reporters with five technicians sailed with the Task Force to the war. The Newspaper Publishers' Association selected them from among 160 applicants, excluding foreign media. The hasty selection resulted in the inclusion of two journalists among the war reporters who were interested only in Queen Elizabeth II's son Prince Andrew, who was serving in the conflict. The Prince flew a helicopter on multiple missions, including anti-surface warfare, Exocet missile decoy and casualty evacuation. Beagle conflict, a border dispute between Chile and Argentina that involved island territory. 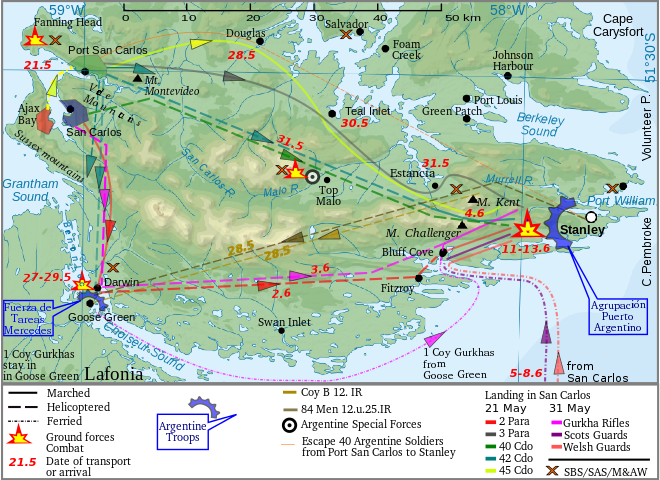 Operation Soberanía, plans for Argentina's invasion of Chile in 1978 and later. 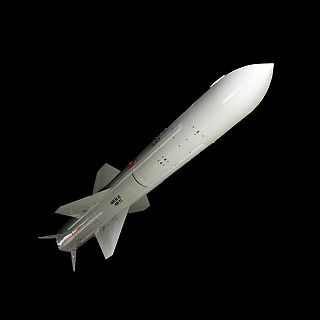 The Exocet is a French-built anti-ship missile whose various versions can be launched from surface vessels, submarines, helicopters and fixed-wing aircraft. This article describes the composition and actions of the Argentine air forces in the Falklands War, which comprised units of the Air Force, Army, Navy and other services. HMS Cardiff was a British Type 42 destroyer and the third ship of the Royal Navy to be named in honour of the Welsh capital city of Cardiff. HMS Ardent was a Royal Navy Type 21 frigate. Built by Yarrow Shipbuilders Ltd, Glasgow, Scotland. She was completed with Exocet launchers in 'B' position. Ardent took part in the Falklands War, where she was sunk by Argentine aircraft in the Falkland Sound on 21 May 1982. 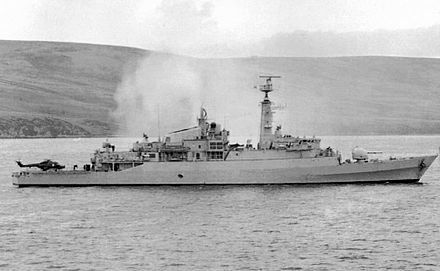 HMS Sheffield was a Type 42 guided missile destroyer laid down by Vickers Shipbuilding and Engineering at Barrow-in-Furness on 15 January 1970. She was launched by Queen Elizabeth II on 10 June 1971 and commissioned on 16 February 1975. She was the second Royal Navy ship to be named after the city of Sheffield in Yorkshire. ARA Santísima Trinidad is a Type 42 destroyer of the Argentine Navy, the only one of her class built outside Britain. She participated in the 1982 Falklands War. From January 2013 to December 2015, the warship was lying on her side, sunk at her moorings in the Argentine naval base of Puerto Belgrano for lack of maintenance. She was refloated and the navy plans to turn her into a museum ship. This article describes the composition and actions of the Argentine naval forces in the Falklands War. For a list of naval forces from the United Kingdom, see British naval forces in the Falklands War. ARA Veinticinco de Mayo (V-2) was an aircraft carrier in the Argentine Navy from 1969 to 1997. The English translation of the name is Twenty-fifth of May, which is the date of Argentina's May Revolution in 1810. These are some of the key weapons of the Falklands War used by both sides. This is a list of the units, aircraft and casualties of the British air services in the Falklands War. The numbers in bold are the number of aircraft used in the war, the numbers in brackets are the number of lost aircraft. For a list of air forces from Argentina, see Argentine air forces in the Falklands War. There were many events leading to the 1982 Falklands War between the United Kingdom and Argentina over possession of the Falkland Islands and South Georgia. The aftermath of the 1982 Falklands War between the United Kingdom and Argentina saw an impact upon world geopolitics, the local political culture in Argentina and the UK, military thought, medical treatment, and the lives of those who were directly involved in the war. Commodore Pablo Marcos Rafael Carballo is a retired member of the Argentine Air Force - the Fuerza Aérea Argentina (FAA) - who fought in the 1982 Falklands War where he participated in actions that led to the sinking of three Royal Navy ships. He was awarded with the highest national military decoration: the Argentine Nation to the Heroic Valour in Combat Cross, the Argentine Congressional Medal, and the Highest Distinction of the Argentine Air Force. The Battle of San Carlos was a battle between aircraft and ships that lasted from 21 to 25 May 1982 during the British landings on the shores of San Carlos Water in the 1982 Falklands War. Low-flying land-based Argentine jet aircraft made repeated attacks on ships of the British Task Force. Corvette Captain Roberto Curilovic is a former Argentinian Navy pilot. His attack on 25 May 1982 in the Falklands War sank the Atlantic Conveyor with an Exocet AM.39 anti-ship missile. The Sea Fleet Command is an arm of the Argentine Navy, is headquartered on Puerto Belgrano Naval Base (BNPB). ↑ "Falklands 25: Background Briefing". Ministry of Defence (UK). Archived from the original on 3 May 2010. Retrieved 1 November 2009. ↑ "Nómina de veteranos de Guerra de Malvinas que cumplen con los requisitos establecidos por la Ley 23.848" (in Spanish). Ministry of Defense of Argentina. Archived from the original on 23 October 2011. Retrieved 1 November 2009. ↑ "Falkland Islands profile". BBC News. 5 November 2013. Retrieved 19 June 2014. 1 2 Historia Marítima Argentina, Volume 10, p. 137. Departamento de Estudios Históricos Navales, Cuántica Editora, Argentina: 1993. ↑ "Argentine to reaffirm Sovereignty Rights over The Falkland Islands". National Turk. 2012-01-04. Retrieved 7 January 2012. ↑ "Cómo evitar que Londres convierta a las Malvinas en un Estado independiente". Clarin. Retrieved 7 February 2010. ↑ "Joint statement of 19 October 1989: Re-establishing Consular Relations Between Britain and Argentina, and Agreeing a Framework on Sovereignty Which Would Allow Further Talks". Falklands info. Archived from the original on 17 May 2012. Retrieved 4 January 2013. ↑ "Constitución Nacional". Argentine Senate (in Spanish). Archived from the original on 17 June 2004. La Nación Argentina ratifica su legítima e imprescriptible soberanía sobre las Islas Malvinas, Georgias del Sur y Sandwich del Sur y los espacios marítimos e insulares correspondientes, por ser parte integrante del territorio nacional. ↑ Bicheno 2006, p. 25: "A basic assumption underlying the conflict was that the British were, in the opinion of the war's main architect, Admiral Jorge Anaya, unworthy heirs to a glorious heritage, the men mainly maricones… to call a man a maricón does not question his heterosexuality; but it definitely impugns his physical and moral courage. Anaya was Naval Attaché in London from January 1975 to January 1976 … He returned to Argentina, making no attempt to conceal his contempt for all things British." ↑ Middlebrook 1989, p. 1: "He was an ardent 'Malvinist' … Anaya was enthusiastic, and his orders in the last days of 1981 were to set in train that tragic series of events." ↑ "Argentina – the horrors of a dictatorial past live on – Radio Netherlands Worldwide – English". Radionetherlands.nl. 30 March 2006. Archived from the original on 10 September 2006. Retrieved 7 February 2010. ↑ "Haig: "Malvinas fue mi Waterloo"". La Nación (in Spanish). 10 August 1997. Retrieved 25 October 2010. ¿Qué creía? Que tenía que ver con despertar el orgullo nacional y con otra cosa. ... La junta – Galtieri me lo dijo – nunca creyó que los británicos darían pelea. Él creía que Occidente se había corrompido. Que los británicos no tenían Dios, que Estados Unidos se había corrompido… Nunca lo pude convencer de que ellos no sólo iban a pelear, que además iban a ganar." ("What do you believe? This was neither about national pride nor anything else. … The junta – Galtieri told me – never believed the British would respond. He thought the Western World was corrupt. 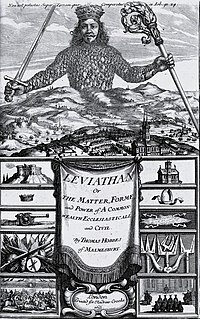 That the British people had no God, that the U.S. was corrupt… I could never convince him that the British would not only fight back but also win [the war]. ↑ "Ministerio de Educación, Ciencia y Tecnología de la Nación" (PDF). Archived from the original (PDF) on 18 March 2009. Retrieved 7 February 2010. 1 2 3 4 Jimmy Burns: The land that lost its heroes, 1987, Bloomsbury Publishing, ISBN 0-7475-0002-9. ↑ "En Buenos Aires, la Junta comenzó a estudiar la posibilidad de ocupar las Islas Malvinas y Georgias antes de que los británicos pudieran reforzarlas". Portierramaryaire.com. Retrieved 7 February 2010. ↑ Briley, Harold (9 April 1997). "Obituary: Captain Nicholas Barker". The Independent. UK. p. 16. Retrieved 2 March 2011. ↑ Barnett, Correlli (1997). "The high cost of cuts". The Spectator. Retrieved 7 February 2010. ↑ "The Falklands War 1982 - Operation Rosario". The British Empire. Retrieved 21 September 2018. ↑ "Falklands War: The first day, 2 April 1982". 2002-04-02. Retrieved 2018-09-21. 1 2 3 Margolis, Laurie (2 April 2007). "UK | How BBC man scooped invasion news". BBC News. Retrieved 7 February 2010. ↑ "No. 49194". The London Gazette (Supplement). 13 December 1982. p. 16109. 1 2 3 4 "A Chronology of events during the Falklands Conflict of 1982". Falkland Islands Information. Archived from the original on 27 March 2010. Retrieved 24 December 2011. 1 2 Freedman 2005b , pp. 21–22: "day-to-day oversight was to be provided by ... which came to be known as the War Cabinet. This became the critical instrument of crisis management"
↑ Gold, Peter (2005). Gibraltar, British or Spanish?. Routledge. p. 39. ISBN 978-0-415-34795-2. ↑ Gold, Peter (2005). Gibraltar, British or Spanish?. Routledge. p. 37. ISBN 978-0-415-34795-2. ↑ Martin, Lisa L. (Spring 1992). "Institutions and Cooperation: Sanctions during the Falkland Islands Conflict" (PDF). International Security. p9. 16 (4): 143--178. Retrieved 11 December 2018. ↑ Krepp, Stella Paresa; Krepp, Stella Paresa (April 2017). "Between the Cold War and the Global South: Argentina and Third World Solidarity in the Falklands/Malvinas Crisis". Estudos Históricos (Rio de Janeiro). 30 (60): 141–160. doi:10.1590/s2178-14942017000100008. ISSN 0103-2186. ↑ "Falklands War cartoon". NZ History. Ministry for Culture and Heritage. 20 November 2013. Retrieved 17 September 2018. 1 2 Black, Joanne (9 April 2013). "From our archive: when Rob met Maggie". Noted. New Zealand Listener. Retrieved 17 September 2018. ↑ Thomson, Mike (5 March 2012). "How France helped both sides in the Falklands War". BBC. 1 2 Fremont-Barnes, Gregory. "An A-Z of the Falklands War". The History Press. Retrieved 16 October 2018. ↑ "Falklands: MT message to President Stevens of Sierra Leone (thanks for allowing Navy ships to refuel at Freetown)". Margaret Thatcher Foundation. 24 April 1982. Retrieved 8 October 2018. ↑ Borger, Julian (1 April 2012). "U.S. feared Falklands war would be 'close-run thing', documents reveal". The Guardian. London. ↑ Grimmett, Richard F. (1 June 1999). "Foreign Policy Roles of the President and Congress". U.S. Department of State. Retrieved 24 February 2010. ↑ Paul Reynolds, "Obituary: Caspar Weinberger," BBC News, 28 March 2006. ↑ "Reagan Readied U.S. Warship for '82 Falklands War". News and Analysis, U.S. Naval Institute. 27 June 2012. Retrieved 27 June 2012. ↑ "The Peruvian Exocet connection in the Falklands/Malvinas war". Mercopress. 3 April 2012. Retrieved 21 April 2012. ↑ "El otro rol de Peru durante la guerra de Malvinas". Infobae (in Spanish). 1 April 2012. Archived from the original on 5 May 2012. Retrieved 21 April 2012. ↑ Robin Yapp (20 April 2011). "Israel 'supplied arms to Argentina during Falklands War'". Daily Telegraph. London. Retrieved 18 April 2012. ↑ "'Begin aided Argentina during Falklands War to avenge the British'". Haaretz. 21 April 2011. Retrieved 18 April 2012. ↑ van der Bijl, Nick (1999). Nine battles to Stanley. Leo Cooper. p. 141. ISBN 978-0850526196. The Junta were slow to admit defeat, but when the news was broadcast, Venezuela and Guatemala offered to send airborne units to 'smash the British in the Falklands'. ↑ "Brazil helped Soviet support operation for Argentina during the Falklands conflict". MercoPress. 23 April 2012. Retrieved 6 June 2012. 1 2 "The Falkland Islands Conflict, 1982". Global Security. Retrieved 25 December 2011. ↑ Woodward & Robinson 1997 , p. 72 Cited in To Rule The Waves: How the British Navy Shaped the Modern World Herman, A (2004) Harper Collins, New York, p. 560. ↑ Freedman 2005b , pp. 431–444 "During the course of May confidence that the naval threat was under control grew. Optimism on the air threat was much scarcer, especially among those who might be on the receiving end." ↑ "AV-8B Harrier Operations". GlobalSecurity.org. Retrieved 21 April 2010. ↑ "Argentine Airpower in the Falklands War". Airpower.maxwell.af.mil. Retrieved 4 January 2013. ↑ Hastings, Max; Jenkins, Simon (1983). The Battle for the Falklands. Norton. pp. 115–116. ISBN 978-0-393-30198-4. ↑ "FAA map". Archived from the original on 24 October 2007. Retrieved 2007-10-24. 1 2 "Submarine Operations during the Falklands War – U.S. Naval War College" . Retrieved 7 February 2010. ↑ "1982: Marines land in South Georgia". BBC. 25 April 1982. Retrieved 20 June 2005. ↑ Ward 2000 , p. 186: "... to get twenty-one bombs to Port Stanley is going to take about one million, one hundred thousand pounds of fuel – equalled about 137,000 gallons. That was enough fuel to fly 260 Sea Harrier bombing missions over Port Stanley. Which in turn meant just over 1300 bombs. Interesting stuff!" ↑ "Offensive Air Operations of the Falklands War". Globalsecurity.org. As a result of these heavy losses ... it was decided to pull the Mirage III's back to the mainland to stand alert for a possible Vulcan attack. ↑ "The Falkland Islands Conflict, 1982: Air Defense of the Fleet". Globalsecurity.org. Finally, the bombing raids caused the Argentines to fear an air attack on the mainland, causing them to retain some Mirage aircraft and Roland missiles for defense. ↑ "La familia Mirage". Aeroespacio (in Spanish). ISSN 0001-9127. Archived from the original on 31 May 2011. "Los M III debían defender el territorio continental argentino de posibles ataques de los bombarderos Vulcan de la RAF, brindar escolta a los cazabombarderos de la FAA, e impedir los ataques de aviones de la Royal Navy y de la RAF sobre las Malvinas." ↑ "The Falkland Islands Conflict, 1982: Air Defense of the Fleet". Globalsecurity.org. Unfortunately the British Secretary of State for Defence announced sometime later that Britain would not bomb targets on the Argentine mainland. This statement was undoubtedly welcomed by the Argentine military command, because it permitted the very limited number of Roland SAM's to be deployed around the airfield at Stanley. ↑ Ward 2000 , pp. 247–48: "Propaganda was, of course, used later to try to justify these missions: 'The Mirage IIIs were withdrawn from Southern Argentina to Buenos Aires to add to the defences there following the Vulcan raids on the islands.' Apparently the logic behind this statement was that if the Vulcan could hit Port Stanley, the [ sic ] Buenos Aires was well within range as well and was vulnerable to similar attacks. I never went along with that baloney. A lone Vulcan or two running in to attack Buenos Aires without fighter support would have been shot to hell in quick time. "-"Mirage IIIs were in evidence near the islands on several occasions during the conflict, either escorting the Neptune reconnaissance missions or on 'interference' flights that attempted to draw CAP attention away from air-to-ground attacks. "-"Suffice it to say that you didn't need more than one or two Mirage IIIs to intercept a Vulcan attack on Buenos Aires"-"It would have taken much more than a lone Vulcan raid to upset Buenos Aires"
↑ "Argentine Air Force remembers its "baptism of fire" twenty years on". En.mercopress.com. 1 May 2002. Retrieved 9 June 2010. ↑ Rodríguez Mottino, Horacio (1984). La artillería argentina en Malvinas (in Spanish). Editorial Clio. p. 170. ISBN 978-9509377028. ↑ "Rodolfo Manuel de la Colina". Fuerza Aérea Argentina (in Spanish). Archived from the original on 7 October 2014. Retrieved 12 March 2015. ↑ "Noticias Municipales | Puerto Madryn". Madryn.gov.ar. 2 April 2009. Archived from the original on 15 April 2012. Retrieved 4 January 2013. ↑ "Fuerza Aérea Argentina". Fuerzaaerea.mil.ar. Archived from the original on 30 April 2009. Retrieved 7 February 2010. ↑ "ASN Aircraft accident description Lockheed C-130H Hercules TC-63 – Pebble Island". Aviation-safety.net. Retrieved 7 February 2010. ↑ Evans, Michael (27 November 2007). "Underwater and undercover: how nuclear subs were first line of Falklands defence". The Times. London. ↑ Peter Beaumont (25 May 2003). "Belgrano crew 'trigger happy'". The Guardian . Retrieved 20 May 2018. ↑ "The SAS vs the Exocet". eliteukforces.info. 27 October 2007. Retrieved 7 February 2010. ↑ Evans, Michael; Hamilton, Alan (27 June 2005). "Thatcher in the dark on sinking of Belgrano". The Times. ↑ "British Special Air Service SAS - The Falklands - Operation Corporate" . Retrieved 2 October 2014. ↑ "Americas | Charles ends Falklands tour on sombre note". BBC News. 15 March 1999. Retrieved 7 February 2010. ↑ Rumley, Leesa (1 June 2007). "Captain Hart Dyke, Commanding Officer of HMS Coventry". BBC News. Retrieved 7 February 2010. ↑ "British Ships Sunk and Damaged – Falklands War 1982". Naval-history.net. Retrieved 7 February 2010. ↑ Gethin Chamberlain (5 April 2002). "Would British forces be able to retake the Falklands today?". The Scotsman. UK. p. 12. Archived from the original on 5 April 2002. (Subscription required (help)). ↑ "The Falklands Conflict 1982". Royal Navy. 2 April 1982. Archived from the original on 9 April 2008. Retrieved 7 February 2010. ↑ "Captain Paul Bootherstone obituary". Guardian. 9 April 2001. ↑ "No. 49134". The London Gazette (Supplement). 8 October 1982. p. 12854. ↑ "Argentine Aircraft in the Falklands". Britains-smallwars.com. Archived from the original on 23 February 2009. Retrieved 7 February 2010. ↑ "Argentine Air Force – Group 5". Skyhawk.org. Archived from the original on 9 May 2007. Retrieved 7 February 2010. ↑ "Super Etendard". Operationcorporate.com. 29 May 2007. Retrieved 7 February 2010. ↑ "HMS Yarmouth, Captains Diary". Archived from the original on 21 March 2009. ↑ "The Argentine Commandos on Mount Kent". Britains-smallwars.com. Archived from the original on 28 March 2010. Retrieved 7 February 2010. ↑ "Argentine Puma Shot Down By American "Stinger" Missile". En.mercopress.com. 12 April 2002. Retrieved 7 February 2010. ↑ Julian Thompson, No Picnic, p. 93, Cassell & Co, 2001. ↑ Rick Jolly, The Red & Green Life Machine, p. 124. ↑ Ewen Southby-Tailyour (31 December 1990). Reasons in Writing: A Commando's View of the Falklands War. Pen and Sword. p. 297. ISBN 978-1-84415-014-4. "It was clear that I was achieving nothing and so, in desperation, I gave a direct order for the infantry to get ashore with or without their kit in order that we could get on with unloading Sir Tristram. The officers ignored my order. In doing so they explained to me quite clearly that no orders would be accepted from an officer of equivalent rank." ↑ "1982:Fifty die in Argentine air attack". BBC News. 1982-06-08. ↑ Bolia, Robert S. "The Falklands War:The Bluff Cove Disaster" (PDF). Military Review (November–December 2004): 71. Archived from the original (PDF) on 16 March 2012. ↑ "An interview with CL (R) Ing. Julio Pérez, chief designer of Exocet trailer-based launcher" (in Spanish). Archived from the original on 2 March 2008. ↑ "The race to regain Thule". Navy News p.21. July 1982. ↑ "Ley 24.950: Decláranse "Héroes nacionales" a los combatientes argentinos fallecidos durante la guerra de Malvinas". InfoLEG (in Spanish). 18 March 1998. Retrieved 11 March 2015. ↑ "list". Ejercito.mil.ar. Archived from the original on 6 April 2010. Retrieved 7 February 2010. ↑ "list". Fuerzaaerea.mil.ar. Archived from the original on 6 April 2010. Retrieved 7 February 2010. ↑ "Databases – Falklands War 1982". Roll of Honour. Retrieved 4 January 2013. ↑ "list". Raf.mod.uk. 1 October 2004. Archived from the original on 6 June 2011. Retrieved 7 February 2010. 1 2 3 4 "Falkland Islands – A history of the 1982 conflict". Raf.mod.uk. 1 October 2004. Archived from the original on 21 March 2009. Retrieved 7 February 2010. ↑ "Para". Raf.mod.uk. 1 October 2004. Archived from the original on 11 December 2009. Retrieved 7 February 2010. ↑ "SAS". Raf.mod.uk. 1 October 2004. Archived from the original on 11 December 2009. Retrieved 7 February 2010. ↑ "rest of army". Raf.mod.uk. 1 October 2004. Archived from the original on 11 December 2009. Retrieved 7 February 2010. ↑ Peter. "HMHS Uganda History". Merchantnavyofficers.com. Retrieved 9 June 2010. ↑ "Swavesey St Andrew Roll of Honour". Roll-of-honour.com. Retrieved 9 June 2010. ↑ Davis, Ian (17 October 2014). "NATO's Ebola 'capability gap': where are the hospital ships?". NATO Watch. NATO. Retrieved 2 February 2017. ↑ "1983: Thatcher triumphs again". BBC News. 5 April 2005. Retrieved 8 June 2010. ↑ Kapur, Navneet; While, David; Blatchley, Nick; Bray, Isabelle; Harrison, Kate (2009). Hotopf, Matthew, ed. "Suicide after leaving the UK armed forces—a cohort study". PLoS Medicine. 6 (3): e26. doi:10.1371/journal.pmed.1000026. PMC 2650723 . PMID 19260757. ↑ "Edición Impresa | Una fecha trágica de nuestra historia". Perfil.com. 4 January 2012. Archived from the original on 1 May 2013. Retrieved 3 January 2013. ↑ Norton-Taylor, Richard (14 May 2013). "Falklands war: new study debunks claims of high suicide rates". London: The Guardian. Retrieved 12 July 2013. ↑ "1982 Liberation Memorial - Things to Do in the Falkland Islands". www.falklandislands.com. Retrieved 2018-02-14. ↑ "Lady Thatcher marks Falklands anniversary at St Paul's". Archived from the original on 3 March 2008. ↑ "Falklands (Las Malvinas) War Memorial Wall". Archived from the original on 16 July 2007. Retrieved 16 July 2007. ↑ Peter Snow, Dan Snow (16 July 2008). "1982 Falklands". 20th Century Battlefields. BBC. BBC Two. Retrieved 20 October 2011. After the war the British government offered to return the bodies of the Argentinian dead to Argentina for burial, but their government refused. They said that these islands were part of Argentina, and the bodies would remain here. 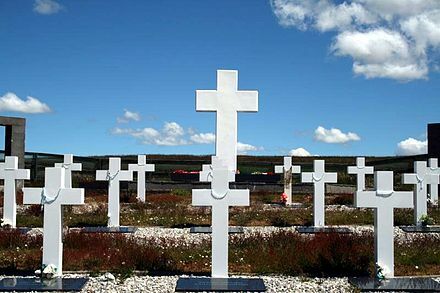 For the Falkland islanders, these graves are daily reminder that Argentina refuses to drop its claim their homeland. 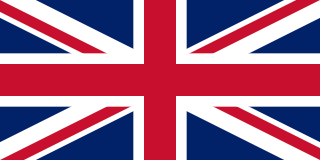 ↑ "United Kingdom – Mine Action, Contamination and Impact". Landmine and Cluster Munition Monitor. 21 September 2011. Retrieved 16 June 2012. ↑ "Falklands' land mine clearance set to enter a new expanded phase in early 2012". MercoPress. Montevideo. 8 December 2011. ↑ "Falklands recover 370 hectares of Stanley Common made minefields in 1982 by Argentine forces". MercoPress. Montevideo. 17 May 2012. Retrieved 17 June 2012. ↑ Middlebrook 1989 , p. 94: "First of May. Menéndez ordered the publication of a newspaper for the troops on the Falkland Islands called Gaceta Argentina. It stated that one of the Mirages lost on 1 May had collided with a Sea Harrier and the Argentine pilot survived. In fact Argentine AAA at Stanley shot down the Mirage when it tried an emergency landing there. It was a blatant lie for all those Argentine servicemen who had seen the Mirage being shot down by Argentine guns and had removed the dead pilot from the crashed aeroplane. Similarly, the junta's press office in Buenos Aires informed that Lieutenant Antonio Jukic, who actually was killed in his Pucará on the ground at Goose Green, had perished in a gallant, single-handed Pucará attack on HMS Hermes, setting it on fire. This statement was illustrated with dramatic sketches. The men at Goose Green knew that Lieutenant Jukic had died on the ground there. Gaceta Argentina summed up the British losses up to 25 May as: 5 warship sunk (correct number 3), 3 transport ships including SS Canberra (1; Atlantic Conveyor), 14 Sea Harriers (2 shot down & 3 accidents) and many ships damaged, including HMS Hermes. Gaceta Argentina even wrote: 'All of these details refer only to proven claims and not to estimated or unproven claims ...'." ↑ "title missing". La Nación (in Spanish). May 1982. No se engañen en Europa. No es una dictadura la que lucha por Malvinas, es la Nación entera. Opositores a la dictadura militar, como yo, estamos luchando por extirpar el último resto de colonialismo. ↑ "Margaret Thatcher portrayed as a pirate, 30 April 1982". Science and Society Picture Library. Retrieved 1 July 2011. ↑ Mather, Ian (1 April 2007). "I went as a reporter but ended up a prisoner of war". The Observer. London. ↑ Freedman, "two journalists on Invincible were interested in no issue other than what Prince Andrew, a helicopter pilot as well as the Queen's son, was up to". ↑ "'Voice Of Falklands War' Ian McDonald Remembered". Forces Network. 2019-04-10. Retrieved 2019-04-11. ↑ "When Britain Went to War". Channel 4. Retrieved 7 February 2010. 1 2 Dawn Fowler. "Margaret Thatcher And Falklands War Drama" (PDF). Archived from the original (PDF) on 14 March 2012. Retrieved 9 February 2011. 1 2 "A new Britain, a new kind of newspaper". The Guardian. London. 25 February 2002. Retrieved 9 February 2011. ↑ Stefanie Hauk. "Between censorship and rude sensationalism – Falkland and "the information war"" (PDF). Retrieved 9 February 2011. ↑ Kassimeris, George; Buckley, John D. (16 February 2010). The Ashgate research companion to modern warfare. p. 425. ISBN 978-0-7546-7410-8 . Retrieved 9 February 2011. The Falklands conflict was no different, although the excessively jingoistic headlines of The Sun newspaper ('UP YOURS GALTIERI! ', 'ARGIE BARGEY' and 'GOTCHA') resulted in a downturn in readership. 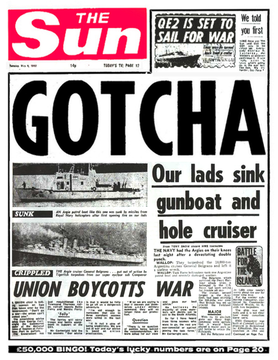 ↑ "The Sun newspaper on the Falklands". The Guardian. London. 25 February 2002. Retrieved 7 February 2010. ↑ Douglas, Torin (14 September 2004). "UK | Magazine | Forty years of The Sun". BBC News. Retrieved 7 February 2010. ↑ "War". British-library.uk. 4 May 1982. Retrieved 7 February 2010. ↑ "Falkland Islands: Imperial pride". the Guardian. 2010-02-19. Retrieved 2 October 2014. ↑ Por MATIAS QUEROL. "Malvinas, el curioso renacer del rock argentino". About. Archived from the original on 8 June 2013. Retrieved 2 October 2014. Barnett, Anthony (1982). Iron Britannia: Why Parliament Waged Its Falklands War. Allison & Busby. ISBN 978-0-85031-493-9. Bicheno, Hugh (2006). Razor's edge: the unofficial history of the Falklands War. Weidenfeld & Nicolson. ISBN 978-0-297-84633-8. Blakeway, Denys (1992). The Falklands War. Sidgwick & Jackson. ISBN 978-0-283-06101-1. Brown, David (1987). The Royal Navy and the Falklands War. Leo Cooper. ISBN 978-0-85052-059-0. Dalyell, Tam (1982). One man's Falklands. Cecil Woolf. ISBN 978-0-900821-65-3. Dalyell, Tam (1983). Thatcher's Torpedo. Cecil Woolf. ISBN 978-0-900821-66-0. Eddy, Paul; Gillman, Peter; Linklater, Magnus; Sunday Times of London Insight Team (1982). The Falklands War. Sphere Books. ISBN 978-0-7221-8282-6. Femenia, Nora (1996). National identity in times of crises: The scripts of the Falklands-Malvinas War. Nova Science Publishers. ISBN 978-1-56072-196-3. Finlan, Alastair. The Royal Navy in the Falklands Conflict and the Gulf War: Culture and Strategy (Psychology Press, 2004). Fremont-Barnes, Gregory (2012). The Falklands 1982: Ground operations in the South Atlantic. 244. Osprey Publishing. ISBN 978-1-84908-607-3. Franks; et al. (January 1983). Falkland Islands Review: Report of a Committee of Privy Counsellors (PDF) (Report). HMSO. Cmnd. 8787. Freedman, Lawrence (2005a). The official history of the Falklands Campaign. 1. Routledge. ISBN 978-0-7146-5206-1. Freedman, Lawrence (2005b). The official history of the Falklands Campaign. 2. Routledge. ISBN 978-0-7146-5207-8. Gavshon, Arthur; Rice, Desmond (1984). The sinking of the Belgrano. Secker & Warburg. ISBN 978-0-436-41332-2. Harris, Robert (1983). GOTCHA! The Media, the Government and the Falklands Crisis. Faber and Faber. ISBN 978-0-571-13052-8. Hastings, Max; Jenkins, Simon (1984). The battle for the Falklands. Norton. ISBN 978-0-393-30198-4. Hobson, Chris; Noble, Andrew (2002). Munro, Bob, ed. Falklands air war. North American trade distribution, Specialty Press Publishers & Wholesalers. ISBN 978-1-85780-126-2. Hunt, Rex (1992). My Falkland Days. Politico's Publishing. ISBN 978-1-84275-017-9. McClure, Jason (November 2004). "The Falklands War: Causes and Lessons". Strategic Insights. 3 (11). McManners, Hugh (2007). Forgotten Voices of the Falklands. Ebury. ISBN 978-0-09-190880-5. Middlebrook, Martin (1985). Operation Corporate: The story of the Falklands War, 1982. Viking. ISBN 978-0-670-80223-4. Middlebrook, Martin (1989). The fight for the "Malvinas": The Argentine Forces in the Falklands War. Viking. ISBN 978-0-670-82106-8. Norton-Taylor, Richard (1985). The Ponting affair. Cecil Woolf. ISBN 978-0-900821-73-8. Ponting, Clive (1985). The right to know: The inside story of the Belgrano affair. Sphere. ISBN 978-0-7221-6944-5. Prince, Stephen. "British command and control in the Falklands Campaign." Defense & Security Analysis 18.4 (2002): 333-349. Tinker, David (1982). A message from the Falklands: The life and gallant death of David Tinker: From his letters and poems. Penguin. ISBN 978-0-14-006778-1. Thornton, Richard C. (1998). The Falklands sting: Reagan, Thatcher, and Argentina's bomb. Brassey's. ISBN 978-1-57488-155-4. Underwood, Geoffrey (1983). Our Falklands war: The men of the task force tell their story. Maritime Books. ISBN 978-0-907771-08-1. Ward, Nigel (2000). Sea harrier over the Falklands. Cassell. ISBN 978-0-304-35542-6. Woodward, Sandy; Robinson, Patrick (1997). One hundred days: The memoirs of the Falklands battle group commander. Naval Institute Press. ISBN 978-1-55750-652-8. Tulchin, Joseph S (1987). "The Malvinas War Of 1982: An Inevitable Conflict That Never Should Have Occurred". Latin American Research Review. 22 (3): 123–141. Wikimedia Commons has media related to Falklands War . "Falkland Islands History Roll of Honour". Royal Air Force . Archived from the original on 2 April 2015. Retrieved 8 March 2015. "The Falkland Islands Conflict 1982". falklandswar.org.uk. Schumann, Peter B. "Argentiniens unbewältigte Vergangenheit" [Argentina's unresolved past]. Deutschlandfunk (in German). "The South Atlantic Medal Association 1982". sama82.org.uk. "Battle atlas of the Falklands war 1982 by land, sea and air". naval-history.net. "ITB Batería Costera Exocet en Malvinas: Entrevista con el CL (R) Ing. Julio Pérez" [ITB Exocet battery: Interview with Julio Pérez]. 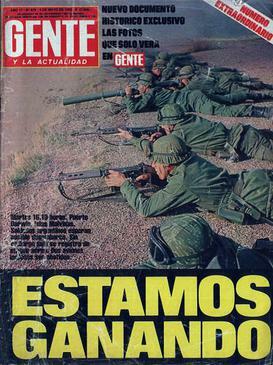 Fuerzas Navales Magazine (in Spanish) (14). 2002. Archived from the original on 2 March 2008. "Coverage of the Falklands war". RadioTapes.com. Rey, Carlos Alberto; Rattenbach, Benjamín; et al. Report Rattenbach: Report of the commission for analysis and evaluation of responsibility in the conflict `South Atlantic` (in Spanish) – via Wikisource. Paul A Olsen (17 May 2012). Operation Corporate: Operational Art and Implications for the Joint Operational Access Concept. School of Advanced Military Studies (Report). DTIC. ADA566546. Lessons of the Falklands. Department of the Navy (Report). DTIC. February 1983. ADA133333.